Resource: IT equipment / infrastructure, people, money or anything else that helps to deliver the service. Resources are assets of the organisation. Capability: The ability of a service organisation, person, process, application or IT service to carry out an activity. Capabilities are intangible assets such as management, organisation, process, knowledge and peoples skills. 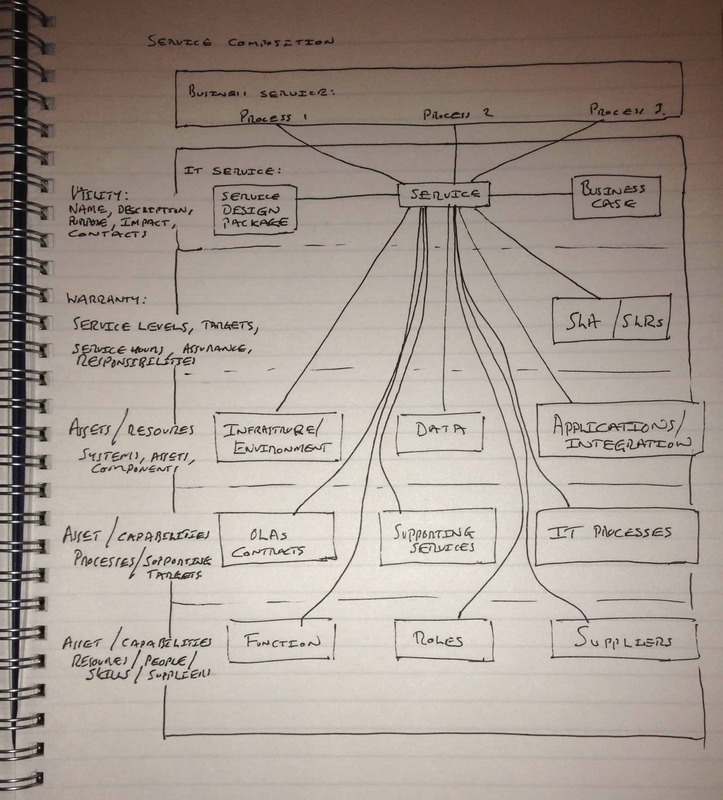 The diagram above shows all the elements that come together to create an IT Service. These are detailed below. Service Design Package (SDP): A package of documents defining all aspects of a service and its requirements through each stage of its lifecycle. Service Level Agreements (SLAs) and Service Level Requirements (SLRs): Set out the level, scope and quality of the service that is to be provided. Infrastructure: All the IT equipment required to deliver the service. Environment: When the IT equipment is securely implemented, typically data centres, machine rooms, power, cooling etc. Applications: All the software required to process the data to provide the information required by the business process for example ERP packages, CRM packages etc. Integration: Solutions to integrate/combine data from different sources. Operational Level Agreements (OLAs) and Contracts: Any underpinning agreements required to deliver the service within the SLA. Supporting Services: Any services required to deliver this service – e.g. Networking. IT Processes: The processes needed by the service provider to ensure the successful delivery of the service for example Service Desk Management, Change Management, Availability Management, Monitoring etc. Functions: Any internal teams providing support for any of the components required to provide the service, for example Service Desk. Roles: Responsibilities, activities, authorities granted to a person or team that control and deploy the resources engaged in the service. For example Problem Managers, Release Managers, Capacity Managers and Service Owners. Suppliers: Any external third parties necessary to provide the service. For example the Internet Service Provider would be a key supplier for a Web Service.